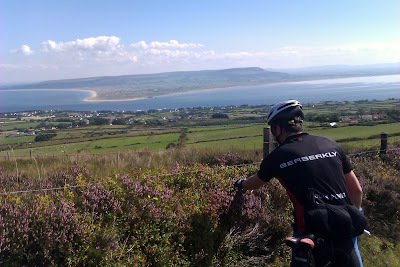 Having been to Inishowen on holidays with my family (but without my bike) earlier in the summer I was very keen to find a way to do some riding there. 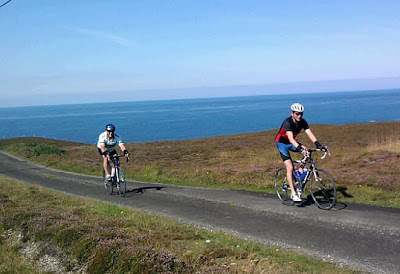 When Kevin Clarke told me he was riding the Inishowen 100 sportive I saw my chance and got my entry in. Run by Foyle Cycling Club in Derry, the Inishowen 100 follows the approximately 100 mile tourist driving route of the same name on a very scenic lap of the Inishowen Peninsula, the most northern part of Ireland. In the best Irish tradition of making things as confusing as possible, it starts and finishes in Northern Ireland but then heads north to the "South" where the vast bulk of the ride takes place. A look at the route map and profile shows two main obstacles en route. 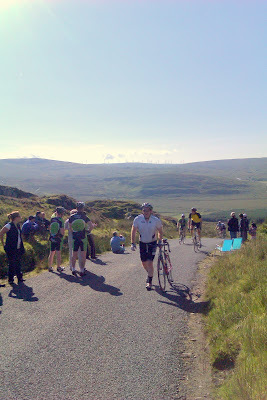 Foyle CC's event takes a clockwise direction around the peninsula which means the legendary Gap of Mamore is tackled quite early while Kinnego Bay comes in the latter stages. Of course, as is the way with these things, what the profile doesn't really show is that in between there are plenty more climbs to sap the legs, particularly in the third quarter of the route. 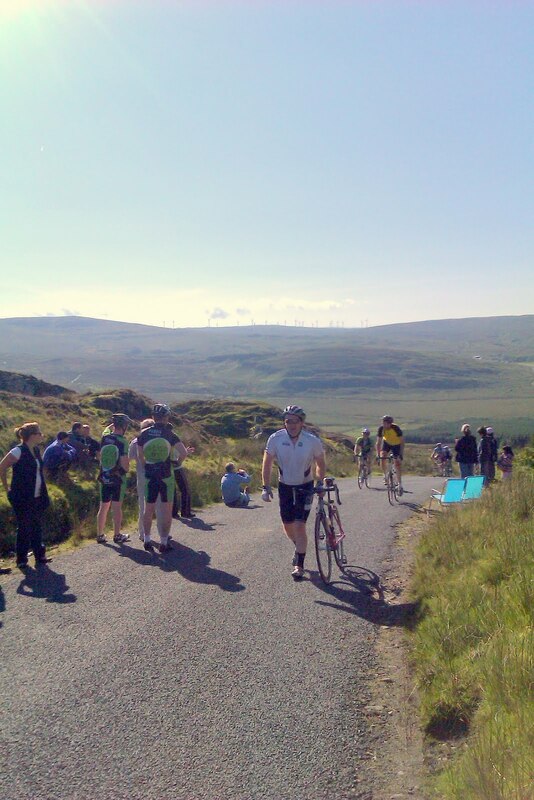 The big fear most riders would have taking on this ride, apart from Mamore of course, is that the final quarter is on wide roads in a south westerly direction. Given the prevailing wind in this part of the world the odds of a strong headwind on this section, when legs are tired, are very high. I'd heard that was the case last year and riders really struggled in the closing stages. So it was with much trepidation that I watched the forecast in the week leading up to the ride. As the day got closer the news was good. Most sources were forecasting a bright, sunny and, most importantly, calm day. I travelled to Donegal the day before the event as I'd arranged to stay in Kevins house near Malin Head. Bypassing Derry, to avoid the annual Apprentice Boys March, I headed for Letterkenny and Buncrana instead, taking me up the west side of the peninsula, on the actual ride route. While the direct road left the ride route after Buncrana, I couldn't resist the urge to check out Mamore. I followed the route arrows instead. My reasoning was that seeing at least part of the route first would put my fears to rest and I'd see that I had nothing to be nervous about. It didn't quite work out that way. Mamore is a monster! And we would be climbing the "easy" side! It's not very high, and it's not very long, but it makes up for that in sheer steepness. After a short, but not insignificant, climb into a beautiful, almost fully enclosed, valley you approach a crossroads. Turn left at the crossroads, where the race organisers had helpfully painted "Get Ready" on the road, and there it is. It rises up in an almost perfect curve, getting steeper and steeper as it climbs. And it intimidates you before you even start climbing. The fact that it's dead straight means you can't take it step by step like other climbs. The fact that there is no tree or hedge cover to hide the grandeur of the surrounding hills makes it feel like the mountain is taunting you into submission. The narrowness and poor surface of the road rules out the possibility of zigzagging up to lessen the gradient. Clinging to optimism I noted that the car was only in second, not first, on the steepest bit, and that the gradient eased off slightly just before the top so if I could just get to there..... As I drove on I started to feel better. I can do it! I can fulfil my goal of getting up it without walking. I have to say that lying in bed later that night my optimism started to flag and I could feel the climb looming over me in my dreams! But at least the weather looked good. The dramatic sky at Malin Head that evening boded well for the next day. A dramatic evening at the top of Ireland. 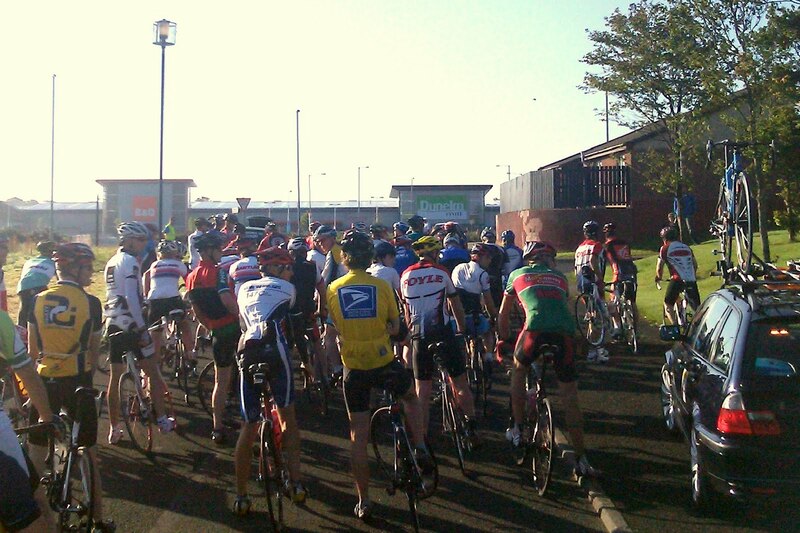 We had an early start on Sunday, for the drive back to Derry. As we hoped it was a glorious, calm morning and we got there in plenty of time for sign on. Apart from one rider from Naas, we seemed to be the only southern accents around but the atmosphere was welcoming and very friendly as we lined up for the off. As expected, the bunch stayed together for the first, flat, part of the route to Buncrana. Approaching the town I wasn't surprised to see the legendary Joe Barr passing up the outside of the bunch on his way to the front. Last years Race Around Ireland winner is rumoured to be training for the Race Across America, so this would be a short training spin for him. I didn't expect to see him again that day! 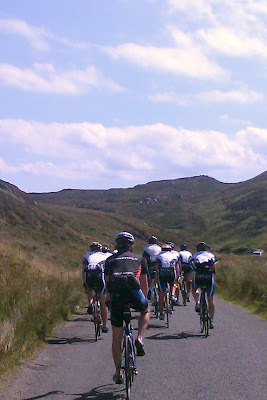 Immediately out of Buncrana the climbing started and the group split and, as we gradually rose towards Dunree, we were now riding in a small group of riders. 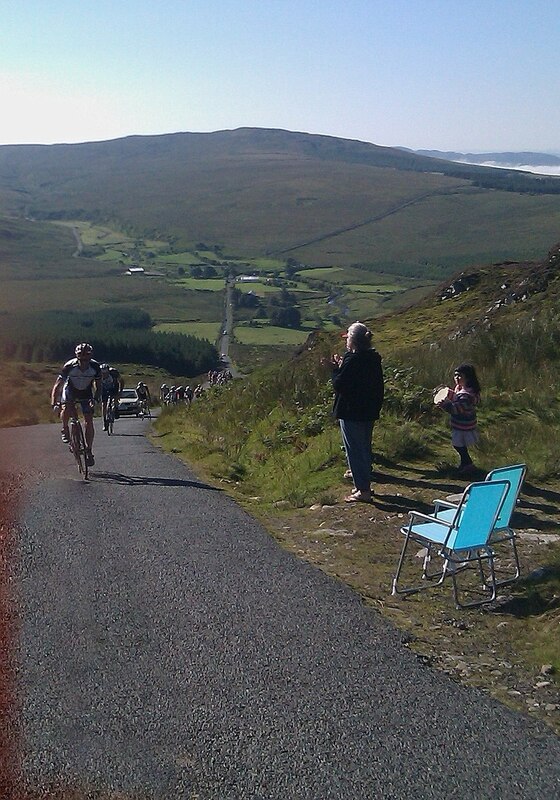 There was only one topic of conversation - Mamore! "Have you done it before?". "How are you going to ride it?". "What lowest gear do you have?" After seeing that lot's of people had triple chainsets or, at least, compact doubles, I was starting to doubt my choice of 39 X 28. I had started convinced that this would be enough but now wasn't so sure. I've only ever needed a 39 X 27 in Wicklow so this was very worrying! Meanwhile the fantastic scenery was being ignored. In the early morning sunshine the low sea mist hanging down on Lough Swilly below us was a magical site. We crested the rise into the valley and approached the fateful left hander. Around the corner I went and there was no going back! First impressions were that it looked even more intimidating from the saddle of a bike than from the seat of a car. But what could I do other than get into a groove and grind my way up. The big surprise was that the "gentle" incline at the bottom was far less gentle than it looked. By a third of the way up I was already on the 28. There were no more gears to go. This hill really does play with your head! By the kink in the road about half way up I was gasping for air and struggling with the gradient. Lot's of riders around me were now walking up. At least I was still riding. My next target was where the really, really, really steep bit eased off, by one really, to just really, really steep. I was inching closer but losing momentum the whole time. My head was swimming, my legs aching and my lungs were about to burst. I was actually groaning out loud, which I don't remember ever doing on a bike before. Despite the urgings of the walkers I just couldn't keep it going. My foot was on the ground almost without my knowing it. I was gutted! My one objective for the day was to ride up this one and I felt like I'd failed. Looking up I could see that despite being only a short 150m or so from the top the gradient made it look like three times that. I've lost a lot of weight this year but I was obviously overgeared for a man of my size and fitness. It really was a case of so near and yet so far. However, I wasn't finished yet. I got my lungs back into the their rightful place and decided to give it another go. But could I get started again on such a steep hill? There was one way to find out so I went for it. I got my foot clipped back into the pedal first time and managed to get some forward movement going. I was back on! The pain started immediately. I was really struggling to move at all but then I heard my name being called. Kevin had started ahead of me on the climb and, being lighter, fitter and with a triple chainset, had obviously got up already. He was cheering me on and it was just what I needed. One last effort and I could look up to see the top right there. I'd made it. I might not have managed it in one go but at least the event photographer would get me on the bike and not walking. Once I was breathing again (!) I was even able to take a few snaps myself before moving on. Of course what goes up must come down. We started down the other side together. The longer, equally steep side! Being a tall, heavy rider I've never been great on descents. I need more time to stop, and my centre of gravity is higher, but it hardly mattered on this one. Everyone was hard on the brakes from the top. Steep ramps, lots of corners, a narrow road and a very poor surface makes for nervous descending. It was no surprise to see two casualties on the way down. One was back up when we got to him but the other was deep in a ditch and was getting attention from the race crew. I heard later that he was OK but was taken to hospital as a precaution. Starting the descent. It's a long way down. After about three quarters of the descent, just before the final section of hairpins, it crossed my mind that the hot weather and constant braking could be a recipe for a blowout. No sooner had the thought crossed my mind than Kevin pulled up with a puncture! At least I got to admire the view while he changed his tube. 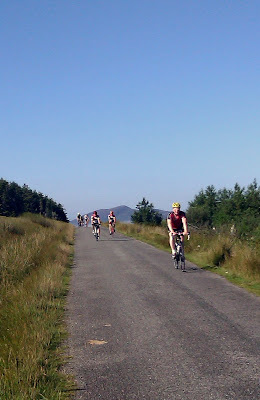 After the exertions of Mamore the next 20 miles or so of the ride were very pleasant. 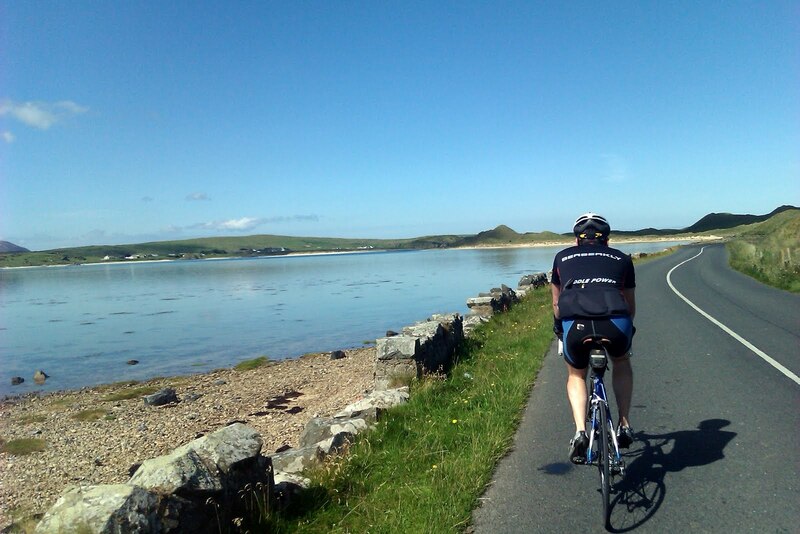 Riding through the quiet towns of Clonmany, Ballyliffen, Carndonagh and Malin in the sun was ideal. Left at the green in Malin village brought us along the dead flat Lagg coastline, towards the next climb overlooking Five Fingers Strand. This one looks awful as you approach it. 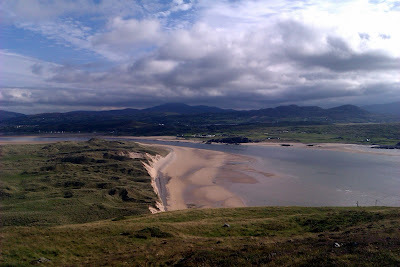 You come around a corner and are faced with a seemingly sheer wall of grassy slopes on three sides, but somehow the road manages to wind it's way around at a reasonable gradient, until finally it emerges above the strand opening up breathtaking views over to the west of Donegal. 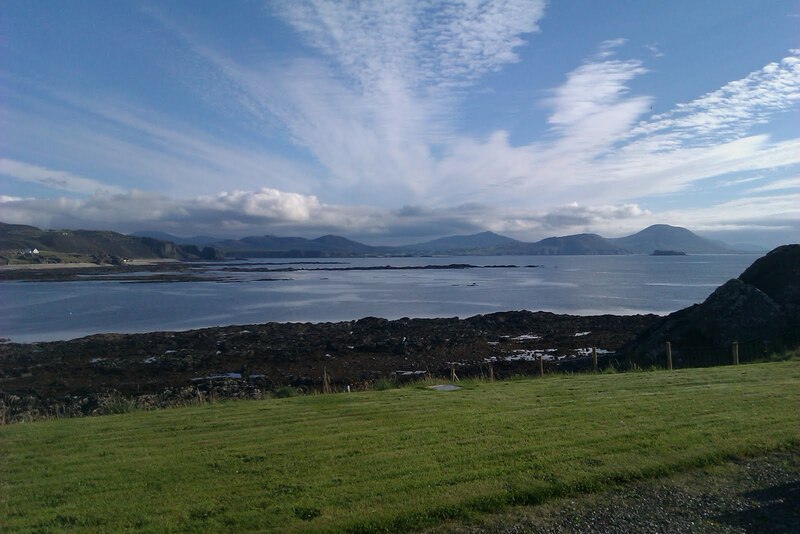 Along the coast at Lagg. Looking down on Five Fingers Strand. This time the descent was a bit more enjoyable. The roads was very narrow and gravelly but at least there were stretches where it was possible to roll for a bit and enjoy the view. About half way down, a woman taking photos at the side of the road up ahead looked familiar. It was my mother! She and my Dad happened to be in Donegal on holidays so they'd come out to cheer us on. That would come in very useful later, when the day started getting very warm and the distance between water sources lengthened. They appeared more than once with much needed drinks which certainly made a big difference to my state at the finish. A much more ridable descent, despite the warnings. Kevin leads me towards Malin Head. 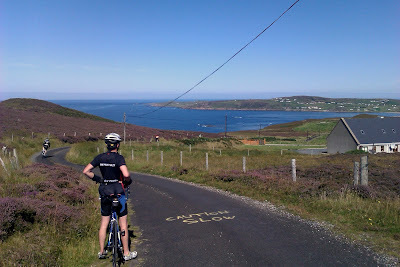 At the bottom of the hill was the village of Malin Head and the first food stop. There were plenty of sandwiches, soup, cakes, chocolate, tea and coffee to help ourselves to in the Crossroads Bar. Though I don't think the bar owner was too happy that the only requests over the bar from this big crowd would be to refill bidons with water. Suitable fortified we set off again and did the short loop around the spectacular Malin Head, passing the most Northerly Point in Ireland as we did so. At least from here the only way was south towards the finish. 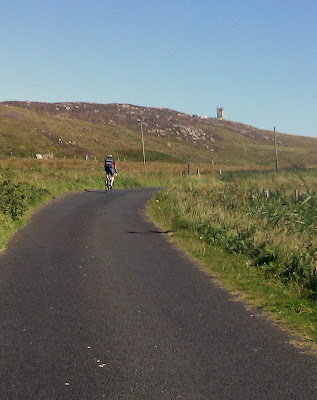 Approaching the tower at Malin Head. It's all south from here. But there was a lot of work left to be done before then. And it started almost immediately. 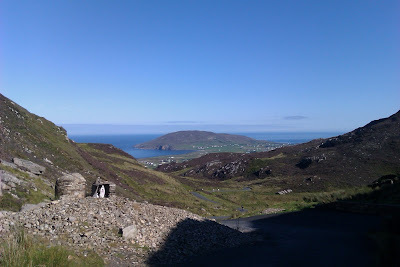 Just outside Malin Head the long, gradual climb to Glengad mountain started. This one wasn't anywhere near as challenging as some of the others but it did go on for a while. Towards the top we were caught by a group from the Bann Wheelers. These guys were looking serious but we did reckon we could get on the back of them for a bit, at least until the next climb. And what a blast that was. 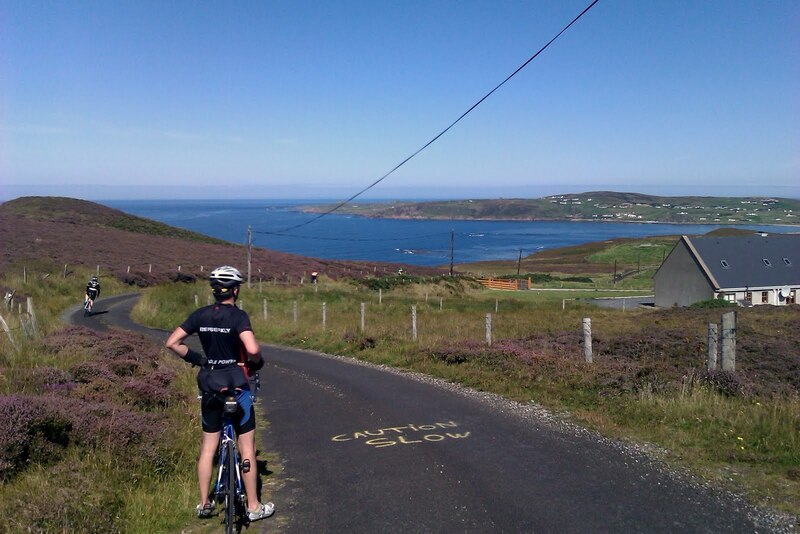 The descent from Glengad to Portaleen was taken at full speed sweeping around the many bends, until we were back at sea level and facing the short, steep climb away from the small fishing harbour. Following the Banns at Glengad. I was a rookie on the i100 but Kevin had ridden before. He'd spoken to me about the upcoming climb from Kinnegoe Bay and must have been going mad from the number of times on a climb he had to tell me that "it's much harder than this one". It was funny then to hear him tell one very disappointed guy from Bann Wheelers, "No, this isn't Kinnegoe. It's much harder than this.". Meanwhile the poor guys mates were disappearing into the distance ahead of us. We dropped down into Culdaff next. I was running out of water but didn't see a shop open. I stopped at the Caratra Bar, beside the beautiful beach where I'd been boogie boarding just a couple of weeks before. The lovely lady there, without my asking, started to pile ice into my bottle before topping it off with water. What bliss! The ice water hit the spot like you wouldn't believe! Mind you, the two guys drinking at the bar couldn't have looked more surprised if an alien had walked into their bar instead of a cyclist. Onwards and upwards and we climbed a short, narrow but pretty steep climb past a caravan park. A family there were kind enough to applaud us through. It's amazing how that gives you a lift. The next steep descent was down to Tremone Bay. And of course, as was becoming a pattern now, dropping down to sea level means climbing up the other side. So we did. This one wasn't so steep either, although it did ramp up for a couple of short stretches, but it went on, and on, and on. And it STILL wasn't the by now almost mythical Kinnegoe Bay. But that was next. 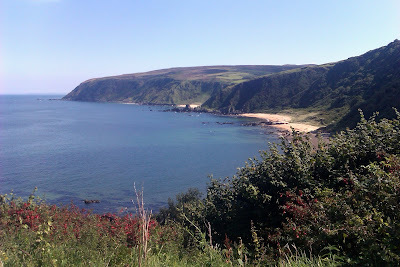 We dropped down another very steep descent and Kevin pulled in among a load of parked cars to have a look at the gorgeous view over the Kinnegoe Bay beach. This was the scene of a famous Spanish Armada wreck but looked more like something from the Caribbean in the sunshine. It was tempting to give up the ride and jump in the turquoise water, especially since my icy bottle was empty already. But there was to be no swimming for us. Instead we started the dreaded final climb of the day right away. The first stretch away from the beach was fiercely steep. It switched back on itself a few times as it virtually scaled the cliffs. But there was some joy as we turned one of the corners to see Mum standing there with water bottles. She'd scoured the area for a shop and finally managed to get two small bottles from a cafe. It wasn't much but every little helped. From there the road rose in a straight ramp before dropping down slightly as it turned into a big valley. And that was when I realised exactly what Kevin had been talking about. The first part, which we'd just come up, was one of the worst of this stretch of coastal climbs but now we were looking up at a mountain. 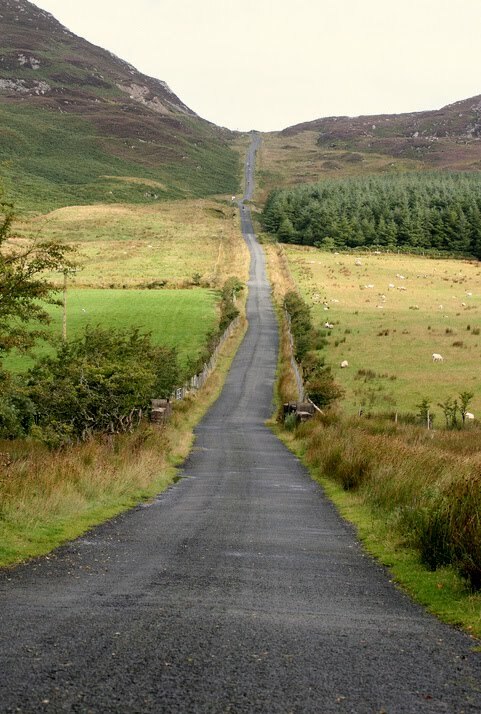 I could see the road snaking right up to a peat ridge, high above us. As if to reinforce my thoughts there was another "Get Ready" painted on the road here. Now where had I seen that before? Adding to the difficulty was the heat in the valley. There was literally no air as we slowed to a crawling pace. The main thing keeping me going was the thought that a) this is the last climb and b) there was a food/water stop down the other side in Greencastle. Onwards and upwards, we again came on several riders walking, especially as the gradient steepened towards the top. But finally the top did come and we had an amazing view down to the mouth of Lough Foyle and across to Northern Ireland. Even better, there was Mum again with more water. What an angel! We even picked some fraughans from the side of the road for some extra sugar. Kevin feasts on fraughans overlooking Lough Foyle. 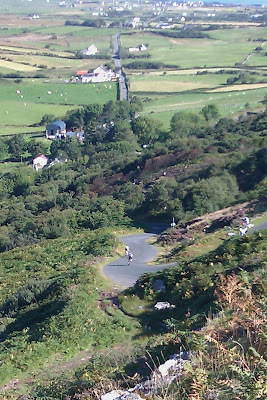 A fast descent to Greencastle and much needed coffee, water, energy drinks and Mars bars. The relief here was palpable. There was still almost a quarter of the 103 miles to go but the climbs were over and the light wind was, if anything, going to be behind us heading home. We kept a steady pace on the main road to Muff, via Moville and Quigleys Point, accelerating hard at one stage in a vain attempt to latch on to a Carn Wheelers quartet riding flat out in a team time trial to the finish. But what was the rush at that stage. Through Muff we took a right and it was a short four miles of country roads back across the border to Derry. We rounded a few suburban roundabouts until the Templemore Sports Center was in sight and we were finished. Time to collect our certificate and t-shirt and reflect on a job well done. Crossing the line. We made it. Overall I felt good at the finish. I certainly had a lot more energy left than I had after the same distance in Meath a few weeks ago. This was a harder course but then we kept a steadier pace and enjoyed the fine weather. 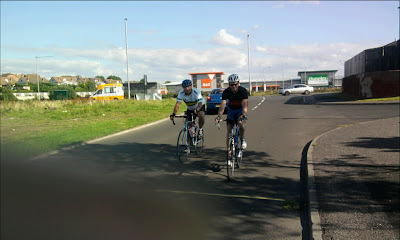 103 miles in just under seven hours is far from record breaking pace but, given the challenges, we were more than happy. Finally, a word about the event. It was a very well run day and probably the friendliest event I've ridden so far. Apart from the good humour at the start/finish and food stops, it was very encouraging to have cars pass from time to time asking if we were OK. Route marking was excellent, especially to warn of hazards, and major junctions were marshalled. There was also a photographer out on the course who's pics will be available online soon (I'll post a link when they appear). Add that to the high quality cert and t-shirt and we have plenty of mementoes to take away. All in all, a great days cycling. 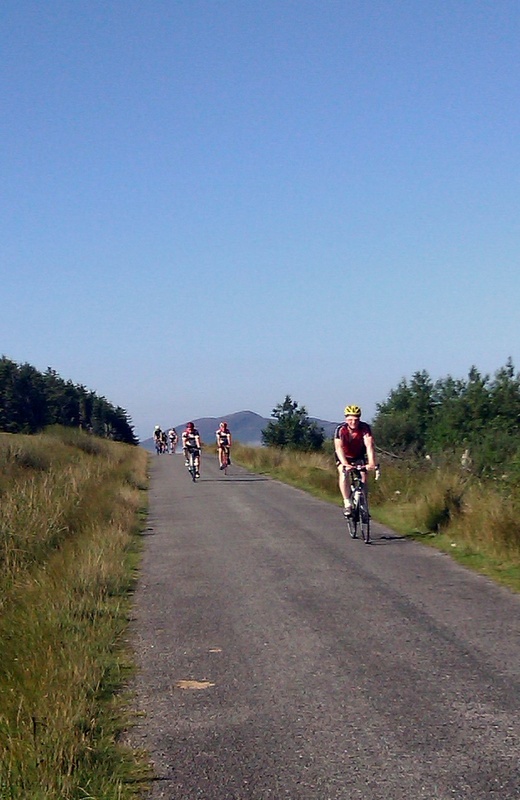 Having had to stop on Mamore I've got unfinished business with this course so I might well be back!